Just popping in to share my scientific notation anchor chart! We only spent about a day and a half on this concept, and I feel like pre-teaching about powers of ten and exponents SO MUCH (you can see a post about those topics HERE) really helped them to quickly grasp this concept. 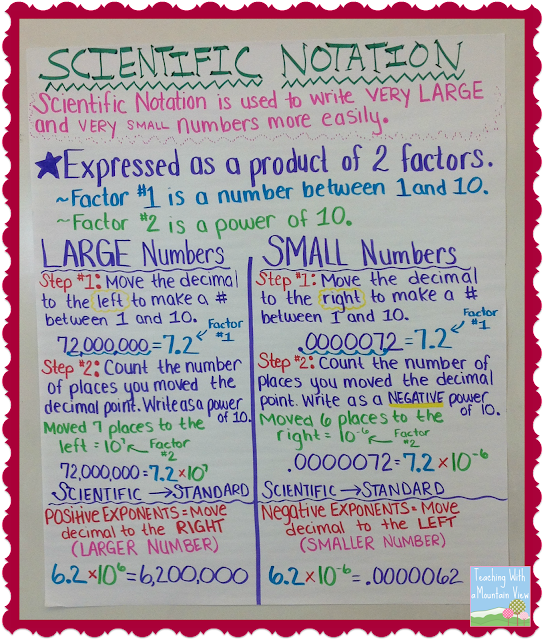 I would be remiss to not mention how much my kids loved scientific notation. What is it about big numbers (or really small numbers, for that matter) that make kids so giddy? I had students come in the next day with numbers to the 72nd power! It was hilarious. Who knew?